With firm commitment to quality, we are engaged in catering to the diversified demands of the customers by bringing forth an assortment of Fabricated Casters. Our range is designed in line with the universally accepted quality norms & standards by employing high-grade polyurethane and stainless steel. Widely appreciated for excellent performance, low maintenance and longer service life, the range can be availed in a plethora of sizes & specifications, which can also be custom-built as per the clients' requirements. 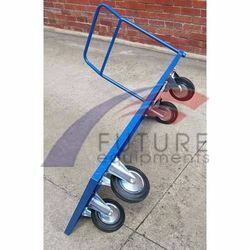 We have emerged as a prominent manufacturer and supplier of Platform Trolley.Owing to their unmatched features such as outstanding impact strength even at very low temperatures, self-lubricating (non-cracking and sticking), sound dampening properties, good chemical and stress cracking resistance, these products are highly acclaimed by the clients. Clients can avail these products as per their requirement.